Serving Frisco, Allen, McKinney, Prosper, Celina, Plano, Richardson, and Dallas, Texas. Iron fencing is making a comeback lately due in part to the rising price of cedar in the past couple of years. Many people are surprised to learn that iron fences can be less expensive to install than cedar fences. 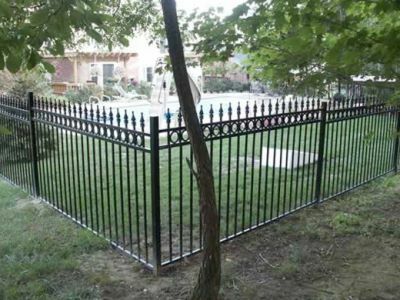 The popularity of iron fences has spurred the introduction of a variety of inferior products to the market. Watch out for 16- and 18-gauge steel. We use only 14-gauge. Do not be fooled; the larger the number, the lighter the gauge. We have seen kids pretending to be Superman by bending 18-gauge fences with their bare hands. At Duck Fence & Deck, we use only 14-gauge steel and we weld the fences. No bolts, bands or sliding components together. That means your fence will need no adjustments, have no rusty bolts and will not move. We use only powder-coated panels, posts and gates, giving the iron the same appearance as a new car. We do not spray paint or roll on paint. Powder coating pairs iron's positive charge with the paint's negative charge, which means the paint is attracted to the entire product and creates a beautifully coated product. How many styles are available? All our panels are custom-manufactured in McKinney, Texas. We have all the basics and can come up with thousands of different styles. You are only as limited as your imagination. Copyright © 2014 Duck Fence & Deck. All rights reserved.